Cordless drills are important to any home improvement task. In this review, we will look at the Bosch 36618-02 18V cordless drill. Use it to help you decide if this is the right power tool for you. The Bosch 36618-02 is a powerful and lightweight cordless drill that comes with a set of two batteries. It has a dura-shield housing, which helps make it resistant to wear and tear. This drill also features 18v batteries that promise to provide up to 35% more runtime compared to other brands. The Bosch 36618-02 cordless drill driver comes with a variable speed trigger that helps you select the best speed for the job at hand. Another smart feature is its ergonomic design that provides optimum user comfort and control. LED lighting also provides work surface illumination. This helps make it easier to work in dark or enclosed spaces. One of the best features of this drill is its Bosch 18V batteries. They provide virtually no downtime because they are fully charged in 30 minutes, the batteries will also be at 85% capacity even after just 15 minutes of charging. The 36618-02’s batteries use Lithium Ion batteries. It also features Bosch’s ECP technology that helps provide maximum cell life, no memory effect, and no self-discharge. The batteries are also up to 1 pound lighter than some of the compact drill batteries in the market. The lightweight design of the slim pack Bosch batteries also makes it ideal for a wide range of jobs. They can also be used with the 18v FatPack. The SlimPack has its weight benefits and the FatPack is going to provide longer run times. This is another great thing about this Bosch cordless drill drive. It is really durable because it comes with a Durashield Housing, which is constructed using an ABS/Nylon composite. That mix makes the drill not only durable but flexible and virtually impenetrable as well. It will not crack easily, even with 10-foot drops. It also features a unibody construction. There are 3 steel straps that keep the gears, motor, and clutch together. It is what will help keep the drill functioning even after a drop. Adding to the drill’s durability is its steel-reinforced collar. This protects the nose of the drill and also protects the chuck from breaking off in the event of a fall. This cordless compact drill also comes with a single sleeve 1/2 inch chuck that helps facilitate one handed chuck changes. The handle has also been redesigned to help provide comfort and give finger support. The Bosch 36618-02 Cordless drill driver comes with Bosch’s three-year ProVantage Guarantee. With this plan, users are given free battery protection for the first two years and tool and battery replacement for the first year. A tool repair package is provided for the last two years of the Provantage Guarantee contract. One disadvantage pointed out by people who have used this drill has to do with the LED light. Many users thought that they had no need for the future, but once they started using it, they found it to be very handy. Their only complaint is that the light should turn on before the drill starts so you can position it right. But, it still works fine and most users do not mind the light not turning on at the start. Plus, it has been designed as power saving technique, without it, the drill can be left on for longer periods of time. Another issue pointed out by one user is that the drill had issues working with 3-inch screws. This, however, is just a result of not using the right speed. Keep in mind that the drill has a variable speed trigger so you need to choose the right speed for the right job. 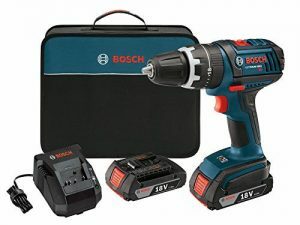 This drill is also available direct from the Bosch website and Amazon. You can get more information on the Bosch 36618-02 drill from the Amazon. You could also visit the Bosch official website for more details.